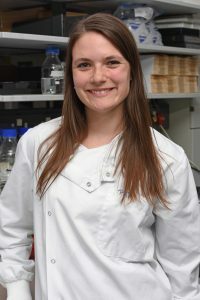 I obtained a BSc in Natural Sciences from Maastricht University (NL) and got interested in cellular metabolism during my undergraduate project at the University of Cambridge. I then moved to Imperial College for a Research Master in Biomedical Sciences and joined the Lloyd lab for my Master’s project. In 2016 I got awarded a NHLI studentship and am exploring the newly emerging field of immunometabolism in the context of interstitial lung disease. My PhD project is investigating the role of airway macrophage metabolic reprogramming in idiopathic pulmonary fibrosis. Using patient bronchoalveolar lavage and mouse models of pulmonary fibrosis I aim to understand how shifts in airway macrophage metabolism might contribute to the development and progression of pulmonary fibrosis.